It's been two years and one month since I last uploaded a book on Amazon. That's too long in my opinion. While I want to release at least one book a year, I'm shooting for more like one per quarter. However, I do work as a copy editor, and those projects by other authors do take precedence over my own. While this blog shows my progress on two of my WIPs (both planned to be fiction series), it was my third WIP, another series, but in the nonfiction genre, that just went live. And, for the record, although Amazon stated it could be seventy-two hours for my book to appear online, it was only five hours and twenty minutes. Thank you, Amazon! The site is getting faster and faster. Amazing. I wrote this planned series of books for me first (to gather all my favorite recipes into one collection of various books in both ebook and paperback form to eliminate the paper clutter of loose sheets of recipes in my home), for my son second (to pass down my family’s heirloom recipes), and to share with my readers third (to make your job of menu planning hopefully easier than it was for me). As both an author and a copy editor, I find it is so much easier to tweak a written document than to create one from scratch. Since nobody’s menu plan will fit everyone’s tastes and lifestyles, it’s a given that any such offering should be personalized. And certainly other people were plagued with this menu-planning task, right? So here is mine to help you out as you craft one better for you and yours. NOTE: I am not a medical professional, but I offer my own insights and some findings from various internet searches here in my menu-planning guide in an effort to provide a convenient launching point for others to create their own menu plans. I have also included thirty-five recipes in this book. 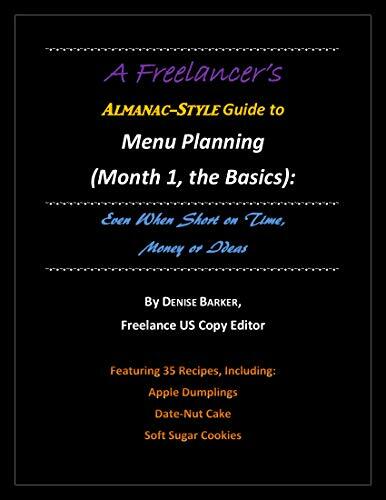 Why a “Freelancer’s Guide” to Menu Planning, You May Ask? From a freelancer’s point of view, it’s all about dealing with the lack of time and/or money when attacking the what’s-for-dinner question. Since I have juggled this time/money issue for over a decade of freelancing, I thought I’d share how I handle this. Therefore, my particular meal planning is flexible, based on available funds. I consider this an almanac-style book because I’ve added in so much more than just a thirty-day menu plan: appropriate quotes, various Top 10 lists, assorted issues (like emotional eating, healthier substitutions, creating convenience foods at home), all of which lend to a sense of diversity in this book. Therefore, being almanac in style. Just getting this first book done has been freeing, a step toward organizing all my recipes. I had a cookbook in me, but it was so daunting to cull through 7,500+ recipes. And those are just the paper copies I have at home. That doesn't begin to count the saved recipes I have on various online sites. Baby steps. Who would imagine how freeing this is for me on this one project? And this bit of organizing is infiltrating into other areas of my home. Simply wonderful! Hope y'all had a great Thanksgiving and are enjoying the Christmas lights popping up everywhere. Have a great week, everyone.